Beat the egg and water in a small bowl with a fork. Stir the sugar and cocoa powder in another small bowl. Sprinkle 2 tablespoons sugar mixture on the work surface. Unfold 1 pastry sheet on the work surface on top of the sugar mixture. Brush the pastry sheet with the egg mixture and sprinkle with 1 tablespoon sugar mixture. Roll up 2 opposite short sides to meet in the center. Wrap in plastic wrap and refrigerate for 30 minutes. Repeat with the remaining pastry sheet. Heat the oven to 400°F. Cut each pastry roll crosswise into 18 slices, making 36 slices in all. Place the pastry slices cut-side down onto 2 baking sheets. Bake for 12 minutes or until the pastries are golden brown. Remove the pastries from the baking sheets and let cool on wire racks for 10 minutes. Microwave the chocolate in a medium bowl for 30 seconds on HIGH. Stir. Repeat until the chocolate is melted and smooth after stirring. 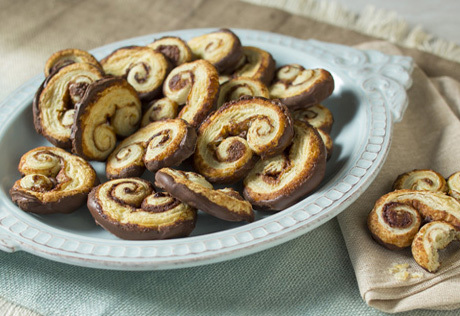 Dip the bottom of each pastry in the melted chocolate to coat and place on parchment paper-lined baking sheets. Refrigerate for 1 hour or until the chocolate is set.